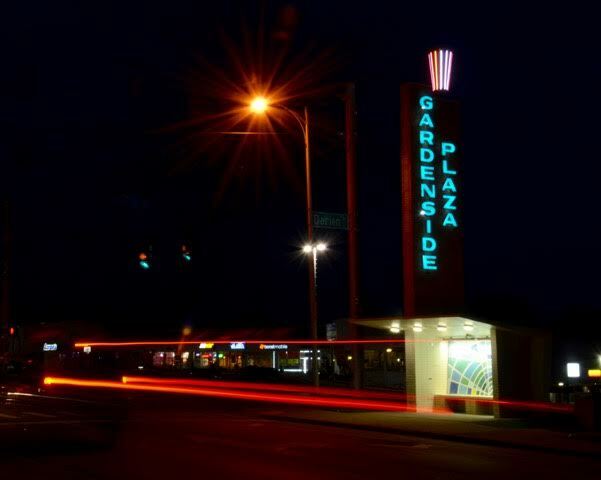 Starting in 2011, the GNA started working with Art in Motion and other partners to raise funds for the renovation and restoration of the Gardenside Sign and Bus shelter. This effort is part of a larger effort to redevelop the Gardenside shopping district and surrounding neighborhood. Built in 1959 by the owners of the Gardenside shopping center, the structure incorporates a bus shelter, but is much more. The shopping center owners spent $8,500 on the structure, an impressive investment in 1950s dollars. The style of the structure is classic mid-century modern architecture with lettering and a light feature on top constructed of stainless steel with neon tube lighting. According to heirs of the original owners, the architecture was inspired specifically by transit shelters and other architecture of the time in Miami Beach, Florida. Art in Motion raised funding from LFUCG, Lextran, non-profit group Lexington Directions, and property owners Pierson Trapp Company totaling $46,000 for the Gardenside Restoration and Mural Project. The structure is an iconic presence in the west end/Alexandria Drive area, with many long-time residents expressing great affection for it. The new partners and trust that own the aged shopping center are investing major resources in restoring and upgrading the buildings and parking lot and bringing in new tenants. 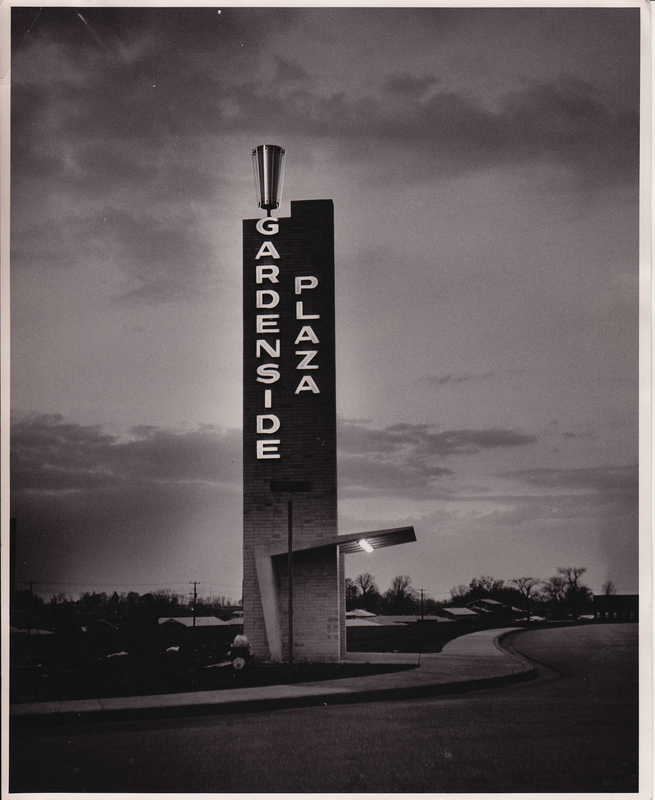 In working with several partners, the GNA has played an active role in revitalizing the Gardenside Plaza area. In addition to the sign above, we have worked with our City Councilperson Peggy Henson, to remove Camelot West from the plaza and we're developing plans to attract new and exciting businesses to the area. In 2015, the Gardenside Neighborhood Association won an Environmental Commission Award from the city of Lexington for its work in cleaning up and restoring our creek. We have Monarch Waystations and other intentional pollinator habitat throughout the neighborhood. 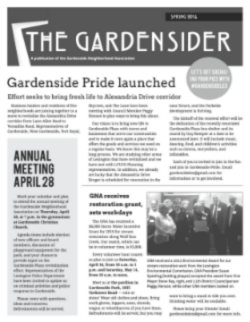 In early 2016, the GNA got news that we have secured even more funding for a native plant garden at the entrance to the neighborhood. Building on the strong tradition and identity here, while embracing diversity and change is central to the development of marketing materials for the neighborhood. The most basic function of the GNA is to keep neighbors informed of things happening in the neighborhood. Our multi-faceted effort includes mailed and electronic newsletters, social media posts, our website, and periodic in-person meetings. Visit our newsletter archive here.